In the United States immigration is a topic capable of polarising opinion like few others. Back in June, President Obama issued an executive order to decriminalise the immigration status of around one million illegal residents in the US between the ages of 16 and 30 (referred to as the “Dream Act lite”). The measure, which has already taken effect, safeguards the rights of eligible young people to remain in the US as they receive a 2 year work permit. These young people were brought to the country as children by their parents and have gone through American public schools. As Obama said, they are American “in every single way but one – on paper.” While not yet enshrined in law and not yet a path to citizenship, it does provide reprieve and legitimacy for around 1 million young migrants in the US. 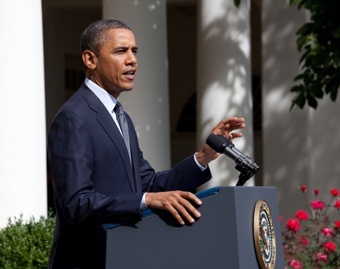 President Barack Obama delivers a speech about the Dream Act lite in the Rose Garden of the White House, 15 June 2012. Official White House photo by Pete Souza. Any directive of this nature will be controversial in a climate where fear and misunderstanding tend to be the norm. Many people have knee-jerk reactions to immigration that aren’t necessarily borne out by the facts. Migration is a heart-wrenching decision for many people from Mexico, but despite the risks every year there are an estimated half a million illegal border crossings into the US and sadly many hundreds of people die annually attempting to cross. Once illegal immigrants get across the border they usually end up working in ‘3D jobs’ – that is, jobs that are dirty, difficult and dangerous. Their families back home have to cope with the economic and emotional shocks of having loved ones working in such precarious circumstances. The 2011 film A Better Life poignantly portrays the hardships of life for an illegal Mexican immigrant living in Los Angeles, caring for a teenage son on his own. He works from sun-up to sundown trying to make enough money to get by, fuelled by the hope of providing a better future for his son. The movie gives some sense of what life is like for illegal immigrants – always looking over one shoulder, never being able to turn to police or other officials for help, and having no safety net to fall back on in times of trouble. It is a difficult existence, but for many it is a decision taken out of necessity. But the stringent border controls that we see today are a relatively recent occurrence. 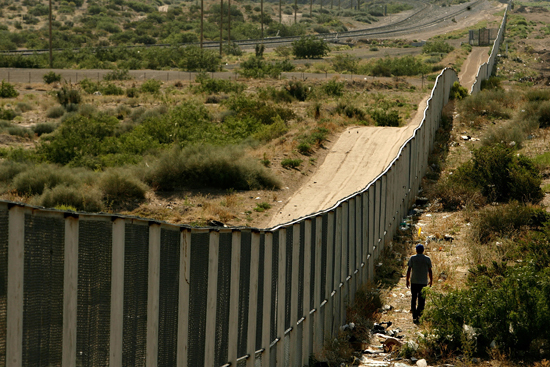 For centuries the border between the US and Mexico has been porous, with both trade and people pouring across daily. Large numbers of Mexican migrants have settled in states like Texas, California and Arizona, but there is an historical basis for these migration patterns – namely that up until 160 years ago these states were actually part of Mexican territory. Following numerous battles for territory, by 1847 Mexico had lost nearly half of its territorial land to the US, including Texas, California, Nevada, Utah and parts of other current US states. Gaining this extra land was as crucially important in the history of the US as it was disastrous for Mexico. The US-Mexican war left Mexico in ruins “physically, economically, politically and socially.” But while it may be easy to redraw lines on a geographic map, it is infinitely more difficult to change cultural practices, societal attitudes and the perceptions of identity among your citizens. Immigration from Mexico to the US has rapidly increased over the past 40 years, during which time 12 million migrants have made the arduous move north. Obviously the main motivating force has been the lure of better economic prospects and a better standard of living over the border. An important indicator of this can be seen in the exponential growth of remittances (money sent back across the border to families in Mexico) and since 2005 income from remittances has accounted for between 2 – 3% of GDP in Mexico. In 2007, US$26 billion was sent in remittances back to Mexico, more than either direct foreign investment to the country or overseas development assistance! So if we acknowledge that there are powerful reasons for immigration (financial, historical and socio-cultural) then it makes sense to try and deal with this mass of thorny issues, rather than trying to sweep them under the rug. Adopting a zero-tolerance stance on illegal immigration is a futile attempt to ignore what is really going on. The idea of building a fence across the length of the US-Mexican border would be farcical if it wasn’t so downright negligent. In fact, the 800 miles of fence along the US-Mexico border has significantly increased the number of deaths of people trying to get across the border. Even worse, the people who designed the fence knew that more people would die as they were pushed away from urban centres and out into harsh desert conditions. They even calculated how many more deaths each year the fence was likely to cause. We cannot continue to adopt such out of touch solutions. The reality today is that after decades of steady migration into the US, many adults living illegally in the US have been their for 10 or more years. Many of these people have children born in the US, so have familial and community ties to their new country. It is estimated that over 3 million children in the US have at least one parent who is an illegal immigrant. All too often these parents are deported back to their home country with no thought given to the future of their children left in the US. This creates unstable and precarious circumstances for this next generation (who are actually American citizens). As for the workforce, it was estimated that in 2005 7.2 million illegal immigrants were employed in the US. This accounts for almost 5% of the total working population. Obviously having a steady, underpaid workforce with few rights has benefited the US economy and indeed overall illegal immigrants contribute more to the economy than they are able to take from it. Each year illegal immigrants contribute $7 billion to social security and $1.5 billion to Medicare in the States, even though they cannot fully reap the benefits they have accrued. Many conservative politicians in the US strongly advocate deportation (even self-deportation), however this ignores the economic facts. It is estimated that the costs of deporting all illegal immigrants from the US would be $2.6 trillion over a decade, while legalising undocumented workers would raise US GDP by $1.5 trillion over the same time period. This is an example of one of the many hidden consequences of current immigration policy, in this case America shooting itself in the foot in terms of drug and gang control. Despite the massive influx of Mexican immigrants to the US over past decades, immigration rates are never set in stone. Recently the Pew Hispanic Centre released findings that in 2011 net migration from Mexico to the US had reached a standstill, or had even reversed (meaning that more people left from the US to Mexico than the other way around). So why are we seeing this historic reversal of trends? While less people are choosing to make the hazardous journey across the border in the first place, it is also true that people are starting to flow back across the border to Mexico. With the downturn in the US economy, more migrants are returning home to Mexico to look for work. Improved prospects for education and work in Mexico has also meant that more people are willing to stay put and carve out their existence there. Although there has been a recent downturn in immigration, it is clearly not an issue that is just going to dissolve into the ether. Zero-tolerance does not work and there are as many economic reasons as there are humanitarian ones as to why illegal immigrants should receive a better deal. After all, immigration is a symbiotic relationship. The US needs its’ millions of immigrants as surely as they rely on the opportunities the US has to offer. If we could imagine for a moment a world without borders, what would that look like? It is an idea as tantalising as it is nerve-racking, but it is largely fear that holds us back from imagining such radical solutions, much as fear once held us back from opening up the workplace to women. There are a myriad of possible solutions to this problem, if only we have the courage to to be honest about what current policies are achieving and what we realistically want to work towards.